Terry ann chebet is currently the host of Kenya’s leading Business News magazine, Citizen Business Centre, and has worked in key financial journalism institutions such as CNBC Africa, CCTV Africa and National Broadcaster KBC. 1. Terry ann Chebet family – she was born in Kitale, Trans Nzoia county, her father was a curator at a Kitale Museum and her mother was a house wife. She has two brothers and two sisters. 2. Terryanne Chebet, the inspirational Kenyan woman entrepreneur and media personality behind the Keyara Organics brand. Keyara Organics is a Natural Skincare line, inspired by Africa and it’s wealth of natural oils and scents of the continent. 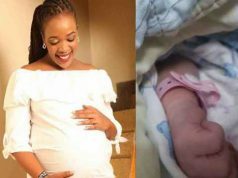 3.Terry Anne Chebet has revealed that her second child was born on the date she was kicked out of Royal Media Services. Ms Chebet was sacked in November 2016 as part of the company’s effort to downsize the workforce. Terryanne Chebet went to Primary and High School in Kitale. From 2000 – 2002, Terryanne Chebet studied French level-2 at Alliance Francaise in Nairobi. From 2001 – 2004 she attended the School of Information & Advertising for her Diploma in TV & Radio production, Public Relations and Advertising. From 2016 – 2018, Terryanne Chebet is studying IBA – International Business Adminstration- Marketing at the United States International University. 6. she added 20kg after giving birth – “I added 20kgs after the baby – from 47kgs to 67kgs. Guys said, ‘now you look like you can speak to adults…’ But I didn’t like it – so I went jogging at Jeffreys,” she says. Chebet, now a mother of two, realised she was pregnant with her first daughter, much to her chagrin. “I panicked because the life I wanted for my child could not be provided for by the money I was getting,” she stated. 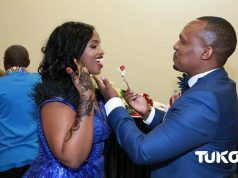 According to a close friend, Monica Kiragu, who was also working at the national broadcaster at the time, they were earning about Sh12, 000 before taxes. “She called me into the bathroom at KBC and broke the news to me. We cried together for a while,” stated Kiragu. When does Terry cry? “I cry over everything!” She laughs. I cry during the Omo advert, while watching engagement videos, reading a book, during heartbreaks…. I am a bag of emotions! Yet, she is still single. Why? Simple. Most of the men who ogle at her don’t meet the cut. They have what it takes but lack the oomph. That IT factor. Chebet loves a man who can keep a conversation going. Not on Whatsapp by the way. She loves a man who is in control. A man who knows the stock market will be plus for the TV presenter. Her life revolves around that. 12. 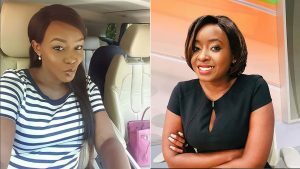 The former Citizen TV presenter is friends with her two daughters and best friends Kirigo Ngarua, Monica Kiragu, Jackie Maribe and Shix Kapienga . they even go for outing together and stay in same hotel, Voyager Beach Resort in Mombasa.